Professor of Geography and Environmental Sciences at San Francisco State University, 1968 – 2005. Ph.D, The George Washington University; BA and MA, University of California, Berkeley. John is survived by his wife Elizabeth, his sons Edward Arthur of Washington, DC, and Erik Karl, and grandchildren Zoey Elizabeth and Lincoln Brewster, of Houston. He was loved by his family of DeAnna Axler, Donna Axler, Doug Fike, Jill Westfall, and Laura DeSimio. John was a very modest man, reluctant to talk about his significant achievements, yet always ready to research and instruct in geography and astronomy. The Eastbay Astronomical Society (EAS) asked him to write about the development and maturing of his interest in astronomy for the August 16, 2016 edition of the EAS newsletter, The Refractor. Oddly, I can remember what started my fascination with astronomy: it was the photograph of Saturn in the 1931 edition of the Lincoln Library of Essential Information. I ran across the eye-catching photo in 1945, when I was seven. It prompted me to find out the address of Chabot Observatory, in my then home city of Oakland, allowing me to write a letter (unstamped) to its Director, Earle Garfield Linsley (1882-1969, Director 1923-47). The kind Professor Linsley introduced me to both the Chabot Observatory and the Eastbay Astronomical Association (as it was then named), which I joined as its ever-youngest (if not ever-young) member in February 1946. Thus, 1945-46 were an exciting couple of years. They even included the greatest meteor shower (actually meteor storm) I’ve ever seen, the Draconids of October 9th, 1946. Somehow, probably through Prof. Linsley, my father took us to our backyard where we watched an ongoing natural fireworks display (estimates gave up to 10,000 meteors per hour); the only problem is that all subsequent meteor showers have seemed tame to me! Frequent attendance at the EAAs (after 1949 the EAS) monthly meetings at Chabot Observatory formed my image of what an observatory should look like: two refracting telescopes (one at each end of the building, just like Lick and Yerkes), exhibits and an excellent library that I haunted, with a collection stretching back to the 19th Century. I owe my parents for their indulgence in my new interest, including a Sky and Telescope subscription starting in 1952 and memberships in the Royal Astronomical Society of Canada and the British Astronomical Association, also during the 1950s. An important aspect of my new EAA/EAS membership was meeting and engaging with persons who shared my interests. It would be several years, though, until I encountered fellow amateurs in my age group, at the 1952 and 1956 conventions of the young Western Amateur Astronomers, in Berkeley and Flagstaff, respectively. Even then I wanted to observe as well as attend talks and meet people. Alfred G. (Al) Leach of the EAS patiently instructed me on the use of Chabot's two telescopes, the 8-inch Alvan Clark refractor, Leah, and the 20-inch Brashear/Warner & Swasey refractor, Rachel (both still in operation). This was just in time for two favorable Mars oppositions, in June 1954 and September 1956. In addition to observing Mars, I was able to use Rachel to observe the Moon during several sessions. Inevitably, by then I had my own telescope. In about 1952 my parents indulged me with a Skyscope 3-1/2-inch reflector, which let me observe my favorite objects, the Moon and planets, on every clear evening from our home in Oakland. Indeed, two years later they surprised me with a better instrument, a 4-inch Tinsley Saturn refractor that I still possess and which was my primary observing instrument from 1954 to 1968 (when I obtained a Cave 10-inch Cassegrain reflector). By the early 1950s it was clear that my astronomical focus was the Moon and planets. (The term planetary science hadn’t yet been coined.) Thus, it was providential in 1953 that I learned of the Association of Lunar and Planetary Observers (A.L.P.O., founded in 1947). As my letter to Earle Linsley had been fateful in 1945, so was my letter to Walter Henry Haas (1917-2015) in 1953. Both men served as my mentor and sponsor in their respective organizations. 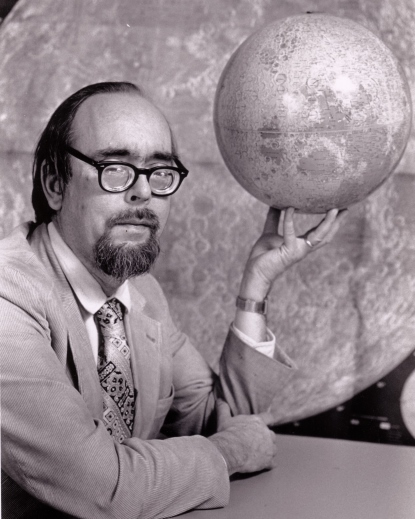 My astronomer interests became focused on the A.L.P.O., first in submitting observations, then in serving on its staff (Lunar Recorder, Associate Director, Editor, and Director). Currently I serve as a member of the A.L.P.O. board of directors and coordinator of the Mercury and Venus transit section and of the Galilean satellite eclipse-timing program. Every year I attend its A.L.P.O. convention. What of the EAS? I still belong and often attend the monthly meetings, although not every month as I now live in Antioch, about 30 miles from Chabot (now named the Chabot Space and Science Center). I have to admit that my EAS membership hasn’t been continuous, as I let it lapse from 1960-68 when I lived in the Washington DC area, employed by the Coast & Geodetic Survey (now the U.S. National Geodetic Survey) and attending the George Washington University, working toward my master’s and doctorate degrees in Geography. As is the case with many aspiring astronomy enthusiasts, participation in a local astronomy club is an important first step. For one thing, you learn that you are not alone in your interests. In my case, probably not unique, it is also important to have the support of one’s family and also to have a more experienced hand serve as your mentor; in my case particularly Earle Linsley and Walter Haas. To all of them I am indebted. John’s interests were terrestrial as well. He was always trying to get a better view of the Universe around, whether through a telescope, in the seat of a small plane flitting above the jagged rocks and crevasses of an Alaskan glacier field, or cruising in a small boat off the frigid Antarctic coast. All in pursuit of a better view. As he looked over the terrain, he also wanted know the stories that it contained: how shallow circular valleys gave lie to a cosmic impact from long ago; how hydro-blasted hillsides revealed both the geologic strata and the uncontained greed of California gold miners; or how the stoic marble grandeur of Roman sites spoke of the inexorable weight of history. His library still brims with the myriad stories of empires long gone, great and desperate voyages, and the people who inhabited these sagas. In his library you will also find some truly fantastic, amazing, even astounding tales. He had a lifelong love of science fiction as well-evidenced by his extensive collection, including an entire bookshelf with books authored and inspired by H.P. Lovecraft. John’s great love of these genres would suggest that perhaps somewhere in these shelves is a dusty manuscript, entitled “A New World to Explore, by John Westfall.” So, go explore, who knows what you will find. Atlas of the Lunar Terminator, Cambridge University Press, 2000. The Transits of Venus, co-author with William Sheehan, Prometheus Books, 2004. Celestial Shadows: Eclipses, Transits, and Occultations, Astrophysics Space Science Library, Springer, 2015. Our Neighbor – the Moon, An Astronomy Book for Zoey Westfall and Lincoln Westfall, privately published, 2017. ….and, perhaps, A New World to Explore, by John Westfall.